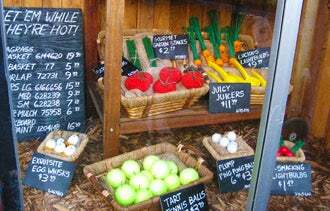 Ladles, sponges, ping-pong balls and lightbulbs were used to create this whimsical farmers market window at Cole Hardware in San Francisco. Your window displays are like billboards for your store. They can be the make-or-break factor in whether a customer enters your shop or walks on by. 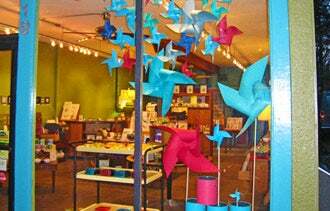 Yet too often, small retailers create windows that are boring, cluttered or poorly lit. "If you just put some thought in it, it doesn't cost much," says Noelle Nicks, who oversees visual merchandising for Cole Hardware's four stores in San Francisco. Although she has never spent more than $100 on a single design, her windows rarely fail to get attention. Her displays have included a farmers market with light bulb carrots and radishes and a beach setting complete with real sand. Nicks and other design experts offer these seven tips on how to create affordable window displays that will lure customers into your store. Cole Hardware in San Francisco takes a spin on the witch-on-a-broomstick theme with this Halloween window display. 1. Tell a story. When Valentine's Day rolls around, you might be tempted to grab every red item off your shelves and cram them in your display. That's too simplistic. "Start with a theme first," Nicks says. "Then plug in the pieces." One Valentine's Day, she chose the theme, “how to mend a broken heart," painting a black jagged line down a giant plywood heart and attaching hinges, chains and other hardware. For Halloween, she hung more than a dozen types of brooms against an orange backdrop with the words, "Which broom?" across the glass beneath them. 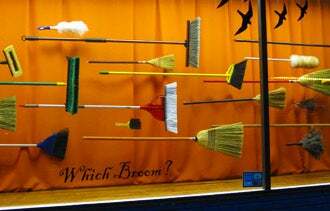 The display not only played on the traditional witch-on-a-broomstick theme, but it also showcased the store's large broom selection. 2. Think in visual planes. 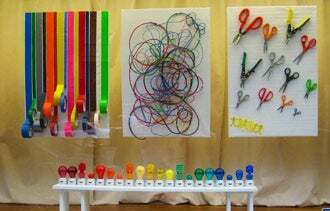 Before arranging a display, Nicks runs a line of blue tape across the window to mark eye level from the street. That isn't something you can simply estimate from inside a window because the floor often isn't at street level. "You want to concentrate the key pieces where the tape is," Nicks says. At the same time, you may not want to keep everything at eye level. Susan Jamieson, a Richmond, Va., interior designer, suggests suspending items from the ceiling or lowering them close to the floor, while maintaining a focal point at eye level. A windmill-themed window at Tilde in Portland, Ore., draws attention with it's giant red and blue decorations. 3. Surprise customers. If you want to get noticed, avoid the predictable. Debbe Hamada, owner of Tilde, a Portland, Ore., gift shop, likes to incorporate unexpected, whimsical objects in her windows. She has used large papier-mâché acorns, forest animals cut from foam board, and giant lockets made of muslin and heavy chains to catch customers' attention. "People come by to look at the window. We get a lot of people [who] take pictures," she says. "It also brings them into the store." Bright colors make this window display at Cole Hardware in San Francisco pop. 4. Use bold shapes and colors. You don't have to be crafty to be good at window design. It's all about bold colors and shapes. In her next window display, Hamada plans to hang giant fuchsia and grey puffs of tissue paper around a few display tables of jewelry--something customers can see from a distance, even though the showcased products are tiny. "Two out of every 10 people come in because they've seen something colorful in our windows," says Hamada, who usually spends less than $30 on a window arrangement. 5. Keep it clean. You don't want to clutter your windows with an assortment of products. "We've found that less product fits with a better quality product," Hamada says, "as opposed to a discount window where you might see a whole bunch of stuff crammed in." That said, you might consider using mass quantities of a single product, says Jon Schallert, a marketing consultant in Longmont, Colo. "A single or a double of anything is not going to get someone's attention. But if you put a dozen of something out, it's going to get anyone to look." A Christmas tree made of tennis balls, for example, is bound to draw more attention than a lone canister of them. 6. Update your displays. You want to change your windows as often as possible, but it doesn't have to be a costly, time-consuming effort. Schallert suggests printing a dozen large photographs that represent your store--images of your products or customers using them, for example--and rotating one or two of them in your window every few weeks. At the very least, update your displays every one to two months, says Linda Cahan, a West Linn, Ore.-based retail design consultant. "The more often you change your windows, the more people will look at your store." 7. Use lighting to stand out. Window lighting shouldn't be an afterthought. "You can really draw a customer in if you just have the correct angle of light on your product," says Schallert, who advises against hanging lights directly above a product to avoid creating shadows. Instead, use lighting to highlight focal points. Cahan recommends investing in a few spotlights you leave on after you close for the night. "If you are the only place with your lights on, you will be the only store people see," she says. "You will be like a beacon of visual stimulation."